Handing over to Alborz Dianat this week to tell us about the Alexander McGibbon drawings he’s been cataloguing and digitising for us! Alborz is a student of Architectural History and Heritage at The University of Edinburgh and his expertise has given us a much better insight into this collection. On the morning of 23rd May, 2014, three volumes of architectural sketches by Alexander McGibbon (1861–1938) were removed from the Glasgow School of Art library. This ensured their survival following the devastating fire that destroyed the Mackintosh library the very same day. Over the past month, I have been cataloguing these sketches and uncovering the life of a former Director of Architecture who might have been forgotten if not for the narrow escape of his drawings that day. The three volumes of sketches are the product of McGibbon’s travels across Scotland and England in the intervening period between his time as a student, and return as a teacher at the Glasgow School of Art. With a delicate hand, McGibbon sketched architecture from Lincoln to Linlithgow. 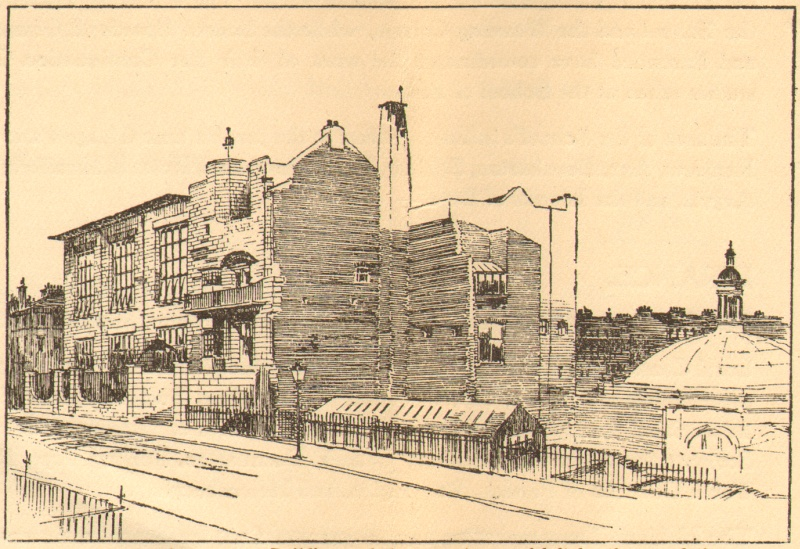 Pencil sketch of Free Church College, Glasgow. Watercolour and pencil sketch of Bothwell Church. Many of these sketches were drawn during visits arranged by the Glasgow Architectural Association, of which McGibbon was an enthusiastic member. As a teacher at the School of Art, McGibbon initially taught weekly evening classes as a visiting lecturer. If a teacher’s talent can be determined through the success of their students, then McGibbon must be given tremendous credit, since among those taking his evening classes was Charles Rennie Mackintosh. In C. R. Mackintosh: The Poetics of Workmanship, David Brett credits McGibbon, along with his colleague Thomas Smith, for the delicate handling seen in Mackintosh’s own sketchbooks. McGibbon was also Mackintosh’s tutor within the architectural office of Honeyman & Keppie, with the two working as senior and junior draughtsman respectively. It is highly likely that McGibbon helped Mackintosh establish his own reputation for draughtsmanship. McGibbon left the firm of Honeyman & Keppie after assuming his position at the Glasgow School of Art in 1890, but kept in contact and in 1907 produced a remarkable drawing of Mackintosh’s partially constructed School of Art building. At the School of Art, McGibbon ultimately took over as Director of Architecture following the death of his predecessor, William Anderson, in 1899. His colleague, Professor Harold Hughes, offered a glimpse at McGibbon’s tremendous work ethic. His practice when at the School of Art was to reach the School in the middle of the morning having had a somewhat late breakfast. He stayed without a break till half-past five. Should be become hungry, he would chew nuts, of which he always carried an ample supply in his pocket. At half-past five he would leave for the good old-fashioned Elizabethan dinner, and returned night after night to the School at seven o’clock, where he stayed till ten o’clock. At ten o’clock he would retire to his small private office and make perspective drawings up to two, three or even four o’clock in the morning. Architects are generally judged by the quality of their buildings. McGibbon cannot be credited with any significant construction, but instead emanated an unseen influence through his dedicated role at the Glasgow School of Art, his vocal presence within the Glasgow Architectural Association, and his frequent articles and drawings for prominent publications. It is very lucky indeed that McGibbon’s sketches escaped the destruction of his outstanding student’s finest work. The catalogue entries for this material (NMC/1726) will be available to view on our online catalogue here. “Obituary: Notable Glasgow Architect, Mr Alexander McGibbon A.R.I.B.A.” The Glasgow Herald, December 7, 1938, 15.